Windows user passwords can easily be compromised by any geek who has physical access to the PC. There are lot of tools to crack, reset, unlock windows accounts and password such as Ophcrack, Reset Windows Password and more. To enhance login security, Windows has a hidden security feature called syskey which gives us an extra layer of security to log in to the PC. This method of security is not easy to crack easily like user account. But there are something you need to consider before doing this. If you forgot the password the only way to reset is formatting the Windows. You need to enter the syskey before log into user accounts. If your PC is used by multiple users, everyone should know the password. Syskey is also known as Startup Key. You can store the syskey in Windows locally or on a USB flash drive. If you set syskey to be stored locally, you will have to enter the syskey whenever you boot up the computer. This tutorial will show you how to lock your Windows 10/8/7/Vista/XP computer with syskey. How to Lock Your Computer with Syskey? Press the Windows key + R to open the Run box, type syskey and press Enter. If prompted by UAC, then click on Continue. 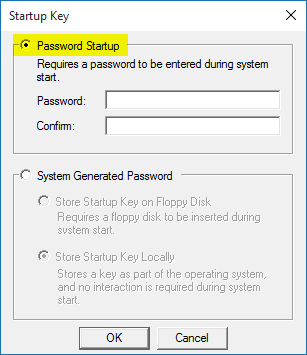 Click on Password Startup, then enter your password for syskey. Click OK. Now it’s done. Next time, you would need to enter syskey to login to your computer. Windows will now require you to enter syskey at startup when you boot your computer. 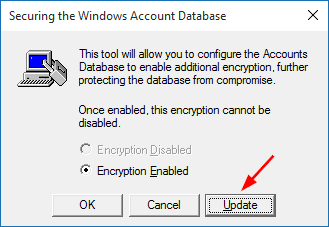 If your Windows account is password protected, then you are still required to enter your Windows account password in order to get into Windows. Forgot your Administrator password? Can’t remember the administrator password? How can you get out of this situation without formatting and re-installing the operating system? You’ve come to the right place! 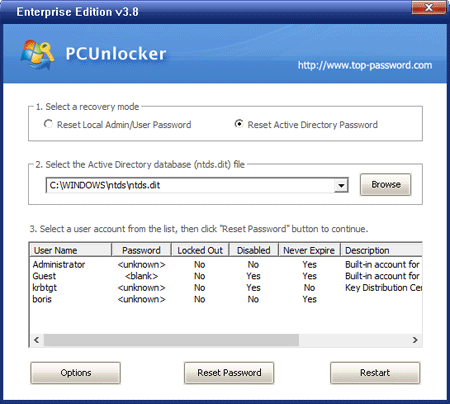 We have a tool for resetting forgotten administrator password in Windows 7/Vista/XP, it is called Reset Windows Password. This software comes with very simple and easy to use user interface. We can use it to reset forgotten administrator password of any Windows computer in just a few mouse clicks. How to Reset Forgotten Administrator Password? Download the Reset Windows Password tool onto a computer you have access to. After download, extract the file, there is an ISO image: ResetWindowsPwd.iso. Burn this ISO image to a CD using ISO burning software such as BurnCDCC. The CD is needed for booting your computer with a forgotten administrator password. After the CD is ready, place it in the CD drive of your locked computer. Go into computer BIOS and set CD/DVD as the 1st boot device, your computer will boot from the CD you’ve created after restarting. Once the boot procedure is complete, it will launch the Reset Windows Password utility. Choose the administrator account and then click Reset Password button to remove your forgotten password. Eject the CD and restart the computer. You will find that it is not asking for password for the administrator account. That’s it, you are done. Forgot Administrator Password in Windows 7/Vista/XP? With this method you can reset administrator password quickly and easily, no need to reinstall the whole operating system. Here is the situation. You just changed your Windows admin password. The next morning when you boot your PC, you can’t remember the password to login to your Windows. You got nervous and don’t know what to do. Every passwords you entered were wrong. But, be calm… Every problems have their solutions. Here are 2 solutions to help you reset / retrieve Windows password quickly and easily. All you need is Ophcrack, a Windows password recovery tool. Borrow someone PC, download the tool and burn it in CD. Then boot your PC with the Live CD and Ophcrack will start do its work. But make sure to set your BIOS to 1st boot from CD or you will end up with boot in Windows. Launch the program and wait the password to be retrieved. Ophcrack won’t work against strong passwords – particularly if you are trying to retrieve a Windows Vista/7 password. The cracking process can take some time, as well, depending on the password you are trying to crack. Simple passwords tend to be quick – complex passwords take more time. If you used a complex password on a Windows Vista/7 machine you may be out of luck. Download the self-extracting Zip file of Reset Windows Password package. Unzip the download file, there is an ISO image: ResetWindowsPwd.iso. Burn it onto a blank CD/DVD or USB flash drive using ISO2Disc or any CD/DVD burning software you like. Boot your locked computer from the Windows password reset disk. Wait until the boot process is complete. When a window pops up with all your Windows accounts, select an user account and then click the Reset Passwordbutton. It will reset Windows password immediately. Now you can then log in to your account with a blank password and regain access to your computer immediately! No need to spend a long time to retrieve your forgotten Windows password. When you try to connect Windows XP based computer system with the use of remote desktop tool, you may not allow to connect with that system and you may receive the following error message “Unable to Log You on Because of an Account Restriction”. The main reason of this error is that remote desktop tool cannot establish connection with the system which have null password. Microsoft offer solution of above problem, you need to setup a user account with a password to establish connection with remote desktop tool. So log on at the console of the computer, and then set a password for that user account. Actually this behavior is due to Windows password restriction policy. So if you wish to establish connect which have null password then you need to disable password restriction policy. You can follow the steps as given below to disable restriction policy. Click Start, point to Run, type gpedit.msc, and then click OK to start the Group Policy Editor. Open Computer Configuration\Windows Settings\Security Settings\Local Policies\Security Options\Accounts: Limit local account use of blank passwords to console logon only. Double-click Limit local account use of blank passwords to console logon only. Click Disabled, and then click OK.
By applying above method you can establish connection with the computer which have null (blank) password. If you have password protected computer then you must need to enter your password to establish connection. In case password is lost for remote desktop tool then there will be no connection created, in this situation you have to apply Windows password recovery method. Have you forgotten your Windows 7 password? This is the common problem which may arrive to every user at some point of time. So, formatting your PC is one solution to your problem. But it may let you loose some of your important data and overall its time consuming. I have a better solution than this. 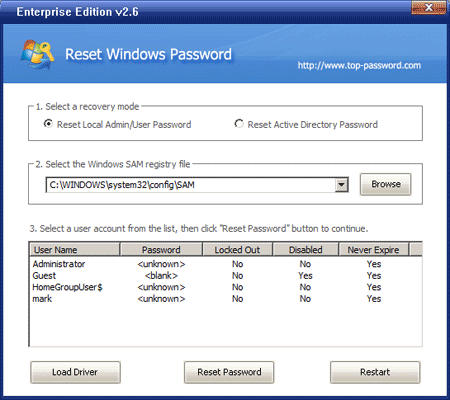 Reset Windows Password is a powerful recovery software that can be used to hack Windows 7 password. It comes with a GUI interface which makes it more simple to use. Here I’m going to teach you how to hack Windows 7 password without knowing the original password. How to hack Windows 7 password? The password hacking procedure can be divided into 3 steps. To prepare for the password-hacking procedure, you need another computer to connect to the Internet, download the Reset Windows Password utility. Unzip the download file which contains an ISO image file: ResetWindowsPwd.iso. Next, burn the ISO image to a CD/DVD with any CD burning software such as BurnCDCC. A Windows password hacking disk will be ready in one or two minutes. Now that you’ve prepared the Windows password hacking CD, go to the computer for which you have forgotten the password. Insert the Windows password hacking CD and turn on the computer. When it is powered on, check the boot-screen for setup key (i.e. DELETE key, F8 key, F2 key) to enter BIOS Setup Utility. Change its BIOS settings to make it try to boot from the CD first. 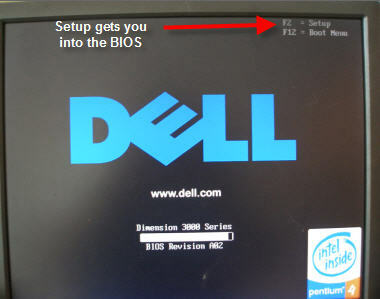 Once you have configured the BIOS correctly, your computer will boot from the Windows password hacking CD. After a while, the boot CD will launch the Reset Windows Password program. Choose the SAM registry hive from the list, the program will display a list of Windows user accounts on the computer. Select the user account whose password you forgot, then click Reset Password button. It will hack and reset your forgotten Windows 7 password in no time. After hacking Windows 7 password, you can then log back into Windows 7 with a blank password. The password hacking method requires that you have physical access to your computer. It also works on Windows Vista/XP/2008/2003/2000. How do I find out my wireless network password? It’s stored on one computer and automatically logs me in when I turn it on, but I can’t remember what it is and someone at my house wants to connect. When connecting to a wireless network or Wi-Fi connection which is encrypted with WEP, WPA or WPA2, Windows will offer to save and remember the wireless password so that Windows can automatically authenticate with the router or gateway to login and connect to the wireless network in future. Chance are even the wireless password is automatically stored by Windows, some users may not even bother to remember the password, until when users reformat or reinstall Windows, or add a new PC to your wireless network. In any case where you can’t remember or lost the wireless password for a wireless connection, and unable to get the wireless password from the router or gateway, the freeware utility, WirelessKeyView can help to find wireless key or password used in WEP, WPA or WPA2 encryption protocol stored in local computer by the ‘Wireless Zero Configuration’ service of Windows XP and by the ‘WLAN AutoConfig’ service of Windows Vista. 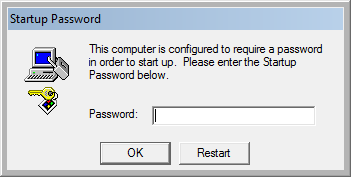 Although the wireless password is saved and stored in local Windows computer, Windows OS does not provide an easy way to recover, find or display the wireless password on screen, in plain text and not hidden as asterisk, until Windows 7. In Windows 8 and Windows 7, you can easily find wireless password without using any third-party software. Forgot domain user password? You will be suggested to use Ophcrack or Offline NT Password & Registry Editor to reset your forgotten domain user password on various forums. But actually these tools don’t work for your situation. Ophcrack and Offline NT Password & Registry Editor are designed to recover / reset the local administrator/users passwords stored in Windows SAM (Security Accounts Manager) file, and they couldn’t be used to reset domain user passwords. Actually, domain user passwords are encoded using a much stronger encryption algorithm and they are stored in a new location: ntds.dit, which is the Active Directory database file. There are few tools and tricks available on the internet which can be used to deal with forgotten domain user password. So here I’m going to show you an easy way to reset domain user password on Windows Server 2008, 2003 and 2000 domain controller. How to Reset Domain User Password? First you need to download Password Recovery Bundle program on another computer. After installing and running the program, click the Windows Password button, which allows you to create a domain password reset disk in 3 steps. Insert a blank CD/DVD or USB drive into the computer and click Start Burn to create such a disk. Insert the domain password reset disk you’ve created into the computer with a forgotten domain user password. Turn on the computer and hold down F2 or whatever the setup key is shown as during the initial boot screen. This should bring up the BIOS. In the BIOS look for the Boot Device Priority option, set CD/DVD as the 1st boot device if you want to boot from CD. You can either set Removable Device as the 1st boot device if you want to boot off USB drive. Save your changes. Restart the computer and now it will boot from the domain password reset disk. After one or two minutes the disk will launch the Reset Windows Password utility. Choose the Reset Active Directory Password option, it will display a list of domain user accounts inside the ntds.dit file. Choose a domain user account and then click Reset Password button. The program will change your domain user password to Password123 by default. Now remove the domain password reset disk and restart the computer, you can then quickly log on to your domain controller with the new password. This method works even if you forgot the domain administrator password or your domain user account is locked out or disable. Easily regain access to your server without reinstalling. Have you forgotten your windows login password? This is the common problem which may arrive to every user at some point of time. The simplest way to reset a forgotten password is by using a previously created password reset disk. You can create such disk on a USB removable media or floppy within the Windows User Accounts Menu, for which go to Windows Control Panel > User Accounts > Create a password reset disk which you will find in the left pane. You can do this to your new PC as once you have the disk, insert it when starting the PC in turn it will cause Windows to display the Reset Password option at the login screen, in this way you will regain an access to your system. But imagine worst case scenario when you try to login to your computer after many days (months may be) and you forget your Windows password and also haven’t created a password reset disk beforehand. What to do next? Here we’ll show you an easy way to reset your forgotten Windows password without a reset disk. How to Reset Your Windows Password without a Reset Disk? After forgetting your Windows password, the computer will become inaccessible and you can’t install any software to get around the problem. The only way is to create a Windows password reset disk and then use it to boot your computer, so you then have the ability of resetting your Windows password. Let’s begin. To prepare for the password-resetting procedure, you need another computer to connect to the Internet, download the Reset Windows Password utility. Next, burn the ISO image to a CD/DVD with any CD burning software such as BurnCDCC. A Windows password reset disk will be ready in one or two minutes. Now that you’ve prepared the Windows password reset CD, go to the computer for which you have forgotten the password. Insert the Windows password reset CD and turn on the computer. Once you have configured the BIOS correctly, your computer will boot from the Windows password reset CD. It will reset your forgotten Windows password in no time. Now take out the password reset CD and reboot your computer. You can then log on to your computer without be asking for a password. It’s also super easy to reset your forgotten Windows password even if you haven’t created a password reset disk beforehand. Two of the most common functions why you might access your system’s BIOS are changing the boot order to allow a CD/USB or other device to boot before a hard drive or supplying a security password to lock your computer. Unfortunately, the BIOS and the way we access the BIOS is far from standardized. Any of the following keyboard keys can invoke the BIOS (sometimes referred to as system setup): F1, F2, F10, F12, Del, Esc, or Ins. Once in the BIOS, you must use the keyboard to navigate the menus and change the settings. Again, this isn’t standardized either and there are at least a dozen implementations of the BIOS interface. Here’s a list of the ways and access keys to press to access BIOS Setup Utility on variety of popular OEM computer systems, motherboard makers and major BIOS brands. Note that some BIOS or computer systems may have more than one method of accessing BIOS depending on when the BIOS is released. DTK (Datatech Enterprises): Press [Esc] Key Right After Powering On the PC. EISA Computer: Press the Reset button on the Front of the Computer, then Press [Ctrl]+[Alt]+[Esc] immediately when the memory count begins or Press [Crtl]+[Alt]+[S]. Fujitsu (LifeBook, Esprimo, Amilo, Tablet, DeskPower): Press [F2] When Fujitsu Logo Is Appearing. Lenovo (Older Products): Press [Ctrl]+[Alt]+[F3], [Ctrl]+[Alt]+[Ins] or [Fn]+[F1]. Packard Bell (8900 Series, 9000 Series, Pulsar, Platinum, EasyNote, imedia, iextreme): Press [F1], [F2], or [Del]. In some cases Outlook doesn’t remember your password, even if you enable the option to remember the password. This error is caused by a malfunctioning of the Protected Storage Space from Windows. To solve this problem, run the registry editor and navigate to the key HKEY_CURRENT_USER\Software\Microsoft\Protected Storage System Provider. You will find a key with a long name starting with S-1-5-21 which you have to delete. In most cases the problem is solved and next time the passwords will be saved. Note: by doing this you will lose all stored passwords in Internet Explorer, Windows Live Messenger and other Microsoft applications. It’s advisable to recover and backup all types of saved passwords using Password Recovery Bundle. If you are not allowed to delete that key, there is probably a problem with the permissions of your user account. Select the key Protected Storage System Provider, right click on it and choose Permissions button and then click Advanced button. Make sure that your user account has Full Control for this key and subkeys. Activate the option Reset permissions on all child objects and enable propagation of inheritable permissions, click OK and repeat the earlier mentioned procedure. If needed, check the Microsoft KB files (http://support.microsoft.com/kb/290684). Here you will find out why Outlook can’t remember password and solutions to fix this problem.